If you are a beginner and you want to learn how to become a pokemaster this post is for you because it will show you how to play pokemon Go for beginners. Which is why we’ve rounded up our best tips and tricks to help you become a Pokémaster. Here’s all you need to know in order to get ahead in Pokémon Go. Pokéstops – All the items you need to play the game are stored in these blue supply stores, dotted around the map. Pokéballs – Used to catch Pokémon and build your team. Incense and Lure Modules – You can use these items to attract more Pokémon to your location. At the start, this is vital to build a large team that you can then use to battle or trade for goodies further into the game. Gyms – Available from level five, controlling gyms is what the game is all about. Located at points of interest and landmarks, these are where the battles between players and their Pokémon take place. Factions – These are the teams you’re asked to join after reaching level five. They will determine which colour a gym turns when you claim it. Simply pick your favourite colour. Potions, Super Potions and Revives – After a hard battle, you’ll need these to help your Pokémon recover before the next challenge. Candy and Stardust – Think of these as supplements to make your Pokémon stronger and more evolved — absolutely vital for taking over more gyms. Eggs – Go is big on XP, and you’ll need Lucky Eggs if you want to earn double XP. Regular eggs allow you to hatch more Pokémon to add to your team. Razzberries – Harder to catch Pokémon can be tamed by feeding them these and winning their trust. 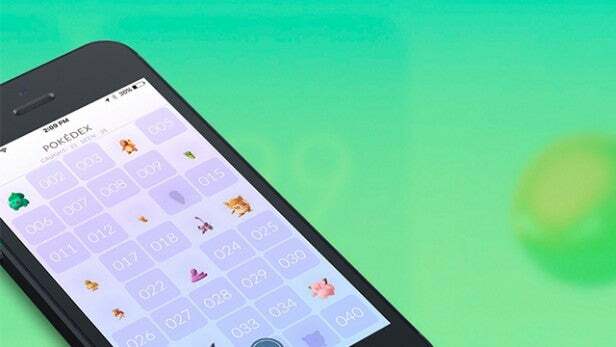 This is the easiest way to start racking up your Pokémon count. 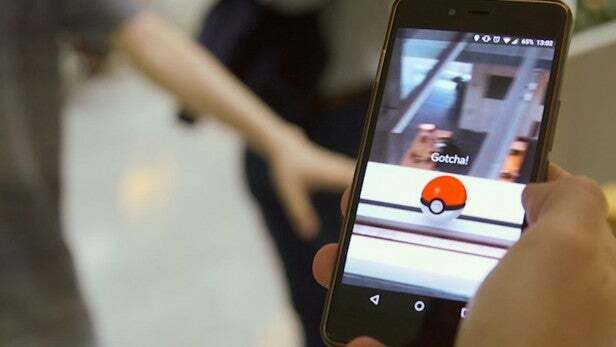 One of the game’s more intriguing features is how it uses your phone’s camera to overlay images of Pokémon onto real-world environments – a crude but still engaging form of AR. Come across a wild Pidgey or Weedle and the game will load whatever you camera is pointed at as a background on which to do battle with the newly-discovered creature. But what you may not be aware of is that using AR mode actually makes it harder to catch Pokémon. 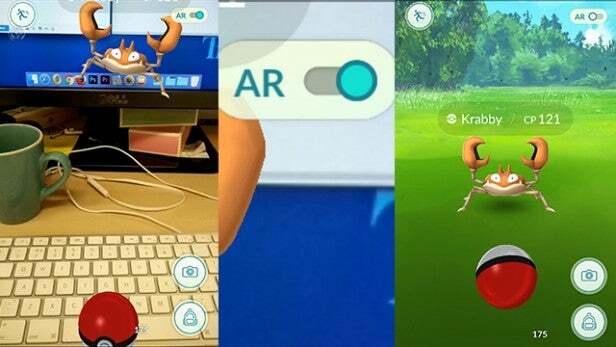 Simply turning off AR allows you to centre the Pokémon on your screen, making it much easier to chuck Pokéballs and claim your prize. 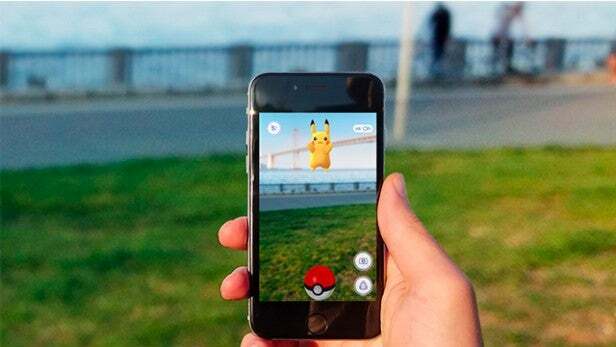 To turn AR mode off, wait until a wild Pokémon appears and tap the AR slider on the top-right of the battle screen. Whichever creature you’re trying to enslave into your Poké-army will immediately move to the centre of the display, ready for the taking. Throw a ball or two and that wily Abra will be yours. That’s because you can immediately trade them in to the Professor to get Pokémon-specific candy. Why is that important? Because candy and Stardust are how you evolve your Pokémon. For example, if you’ve got an abundance of Pidgeys, you should immediately figure out which one of them is the most powerful by seeing which has the highest CP score and the highest-rated attacks. 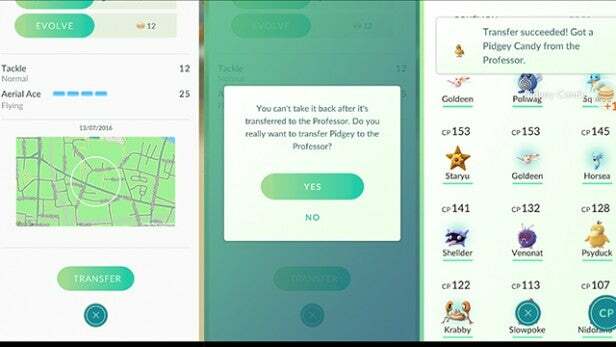 Once you know which one you’re going to keep, select the first Pidgey you want to transfer, scroll down to the bottom of the menu that pops up, and tap ‘Transfer’. You’ll be asked to confirm, after which the Professor will provide you with Pidgey candy. Once you’ve got 12 of these, you’ll be able to upgrade your remaining Pidgey to a Pidgeotto, provided you’ve also managed to collect enough Stardust on your travels. Transfer enough Pidgeys or Pidgeottos and you’ll get enough candy to evolve the Pidgeotto to a Pidgeot. Each Pokémon requires a different amount of candy to evolve to its next state, so keep an eye on how many of each kind you’re collecting and make sure to transfer the less powerful ones to start stacking up the candy for future evolutions. You will receive 500XP for every low level Pokémon you evolve, or 1000XP for every second level Pokémon you evolve. So all those Pidgeys and Pidgeottos you evolve are the fast-track to levelling up. This is also where your Lucky Egg comes into play. Wait until you have lots of Pokémon all set to evolve. Trigger your Lucky Egg and your level-up medal will be imminent. 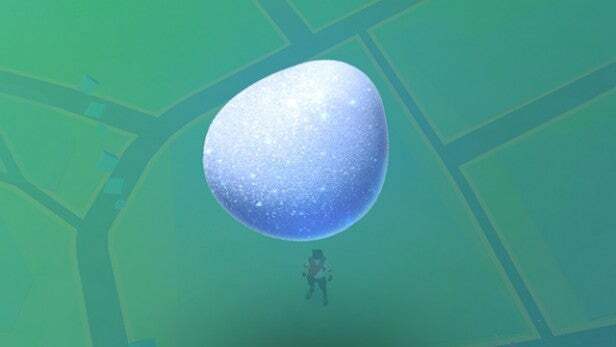 If the game is feeling generous, you may just find yourself in possession of a Lucky Egg. What the hell is that, you ask? Well, ever since we wasted our first Lucky Egg by using it at the worst possible time, we’ve made sure we know the answer to that very question. Basically, a Lucky Egg doubles all the XP you get for 30 minutes. You should start to pick up a few once you reach level 8 or so, and they can also be bought from the shop – if you’re a dirty cheat, that is. As the egg’s effect only lasts for half an hour, you’re going to want to spend that time as productively as you can to maximise the XP you get. Before you start the timer, then, make sure you’ve got a load of Pokémon to evolve, tons of Stardust, a Lure Module or Incense, and plenty of Pokéballs. Also make sure you’re near a Pokéstop and gym. Once you’ve started the Lucky Egg’s timer, drop the Lure Module on the Pokéstop and immediately begin evolving your Pokémon. Pidgeys and Rattatas are good for this, as they seem to crop up all the time and only need 12 candies to evolve, but any Pokémon you have ready to evolve will net you XP once you start upgrading them – and thanks to the Egg, you’ll get double the amount. Once the Lure Module starts to wear off and you’ve evolved all your Pokémon, head to the nearest gym and start racking up the XP by stealing the gym from those wretched Reds, or whichever team happen to be your sworn enemies. If the gym belongs to your team, try raising its prestige with some repeat attacks, and make sure you use any extra Stardust you get to raise the level of your best Pokémon. It all adds XP and should result in a nice and productive half-hour of Lucky Egg levelling. When the game first launched it came with a Nearby tracking feature that showed you how close Pokémon were to your location. 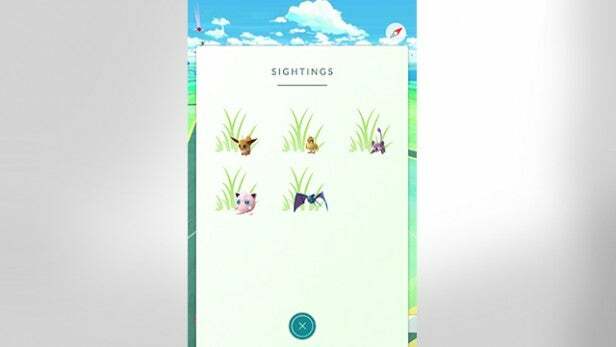 The feature has since been tweaked by the team at Niantic, who have removed the footprint tracking system – a feature which showed you how close a creature was by displaying either one, two, or three footprints below its icon in the list. But although the footprint aspect has been removed, the Nearby tracker still remains part of the game, in the form of the ‘Sightings’ menu, and is arguably easier to use than before. In order to find the Pokémon that are showing on your tracker, you can no longer click on a specific creature and follow the flashing green box to where that Pokémon is supposed to be. To hunt down a specific beast, keep the Sightings display open, walk around, and watch for whether the creature’s icon disappears from the list or not. If so, you’re going the wrong way. Repeat until you happen across the little beast. In the latest update, the circumference of the circle around your character has also been increased. This means you’re able to catch Pokémon that are much further away than you could previously. The distance is now about 200 metres. A new Nearby tracker should be arriving soon, so this could change in the near future. 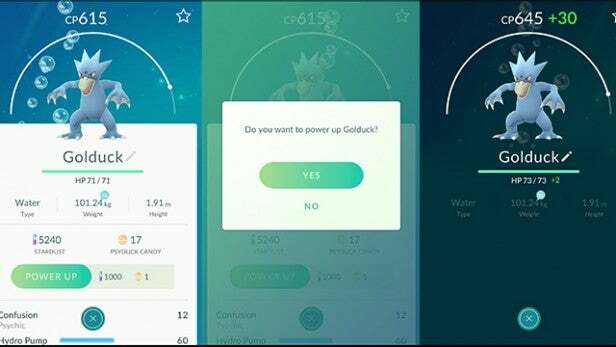 The new system is being trialled by Niantic with certain users, and we’re expecting it to be rolled out to other players soon. One of the most unique aspects of Pokémon Go is that it aims to get you out and about. The more new places you take your Poké-hunt to, the more different Pokémon you’ll find. If you only play the game in your local area, you’ll find yourself catching the same Pokémon time and again. And although this is useful for evolving and levelling up, we are all after the same result – catching as many different Pokémon as possible. So why waste your own lures in your local park when you know it’s only filled with common Drowzees and Rattatas? Instead, make the most of lures other people have dropped in your area. Unlike incense, which will draw Pokémon specifically to you, a Lure is attached to a Pokéstop and can benefit all the Poké-trainers in the area. 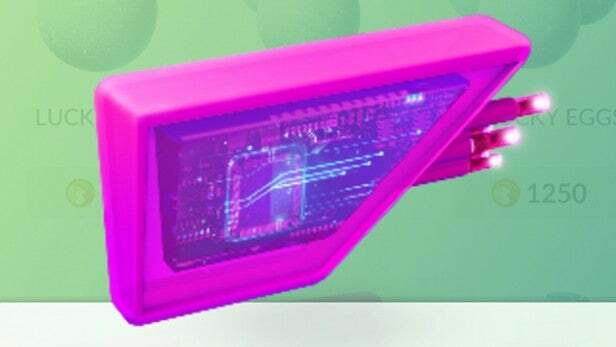 You’ll see be able to tell if a lure has been released at a Pokéstop when the supply store starts showering purple confetti. Keep an eye out for these when walking around your local area, and keep your own Lures and Incense for when you’ve taken your Poké-hunt somewhere new. Once you’ve arrived at a new location and your ‘Nearby’ screen is telling you there are a range of interesting Pokémon close by, this is the time to strike up your Lure or Incense. 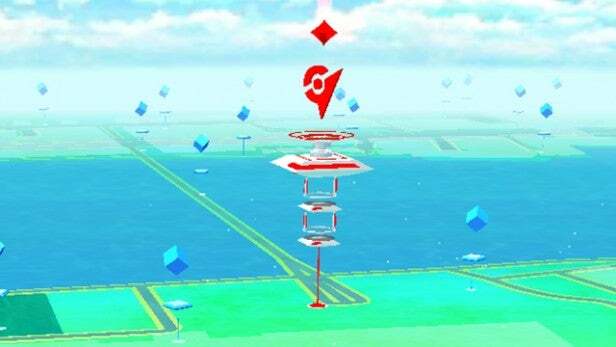 Before using a lure on a specific Pokéstop, make sure you’re able to stay in the same spot for 30 minutes. In no time you’ll find yourself surrounded by Pokémon ready for catching. Although Pokémon Go can be perfectly enjoyable when playing solo, if you want to move up the ranks quickly, it’s advisable to round up a few fellow trainers and travel in a pack. 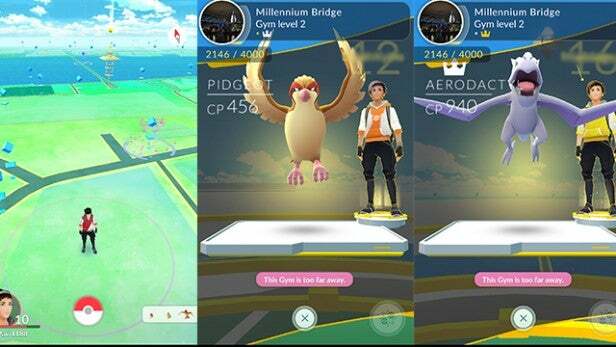 Pokémon Go lets you choose between joining either the Red, Blue or Yellow team once you reach level 5, which forms the basis for gym battles. Whenever you capture a gym, which are dotted around the landscape, you will claim it for your team. And while it’s much more satisfying to steal a gym from some unsuspecting randomer, you’ll have a much easier time levelling up, at least at first, if you travel with some members of the opposite factions. That way, you can roam the land, taking gyms for your team, then losing them to your fellow travellers and repeating the process. This means you’ll all gain the XP that comes with taking and defending gyms without having to wait for an unknown Pokétrainer to come along and challenge you. There’s a few things you can do to save battery life and data. Firstly, there’s the battery saving feature built in to Pokémon Go, which can be found in the settings menu, and should allow you to keep hunting for much longer. Secondly, and more generally, make sure your phone isn’t downloading automatic app updates over your data connection. To ensure you’re only getting automatic updates when you’re connected to Wi-Fi, iPhone users can turn off ‘Wi-Fi assist’ in Settings, while Android users should select ‘Update Apps automatically only through Wi-Fi’ in their Settings. You can also download data-conserving browsers such as Opera Mini, which will load pared-down versions of websites to limit the amount of data used. Chrome users should also check out Chrome Data Saver. Of course, a lot of apps will run in the background, using up your data without you even realising it. To stop this betrayal from going on any longer, iPhone users should go to Settings>General and turn ‘Background App Refresh’ off. Alternatively, you can turn off individual apps’ ability to update in the background in the same menu. Android adherents should go to Settings>Data Usage and scroll down to see a list of apps using data. 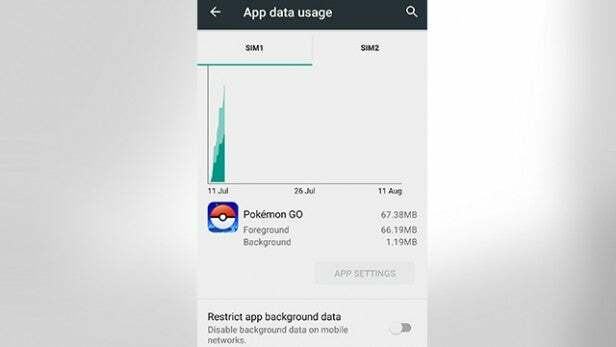 Tapping on individual apps will give you the ability to ‘Restrict app background data’ for particular apps. You should find yourself picking up eggs on your travels, which can be hatched to gain new Pokémon by simply walking around. If you do nothing else, make sure you have at least one egg in an incubator at any one time. You’ll find your eggs by tapping on the Pokemon button then scrolling right to reveal all of the eggs you’ve collected. Eggs will hatch after either 2km, 5km or 10km of distanced travelled. The further you have to walk, the rarer the Pokemon inside is. 2km eggs will hatch your standard Zubat or Spearow, while 10km eggs may hold a Mr. Mime. It’s also worth noting that the longer you had to walk to hatch your egg, the higher the XP you receive. So try to keep track of when your 10 km egg will hatch and use your Lucky Egg to coincide and maximise the XP you get. Even when you’re not actively hunting for Pokémon, make sure Pokémon Go is running in order for it to track how far you’re travelling. The app doesn’t track distance travelled if you don’t have it open while travelling. And don’t think about cheating by using a car either – the game knows when you’re travelling faster than a preset speed limit, and won’t count any distance travelled above this speed. Walking is the most reliable option. However a slow-moving bus in heavy traffic will often do the trick. What’s more, if you have your AR switched off, you may find you can catch a few Pokémon along the way. This is also a great way of checking out where you can find different Pokémon, even if you don’t have time to catch them. Although, if you’re not in a hurry you can always jump of the bus at the next stop and track down that pesky Sandshrew. There are a few tips to follow if you want to improve your catch rate and reduce the number of re-throws you need to make. Firstly, get into the habit of throwing when the catch circle (the coloured ring that diminishes in size) is small. Although it’s easier to hit the Pokémon when the circle is at its largest, and you may have been relying on this technique in the early levels, your Pokémon is more likely to break out afterwards, especially once you start hitting the higher levels. Once you start collecting Great Balls, Master Balls and Ultra Balls, you’ll need to start combining these with Razz Berries to catch high-CP Pokémon, or those with orange or red catch circles. You’ll gradually get the hang of which combination to use for different Pokémon through practice. But, initially, throwing a Razz Berry then following it up with a Great Ball throw to a small catch circle usually does the trick. If your Pokémon still breaks out, you can keep using Razz Berries before each throw as long as you caught the Pokémon in the previous throw. You can’t use multiple Razz Berries without catching the Pokémon in between. That’s right, those seemingly all-important Combat Points aren’t always the best indicator of how a Pokémon is going to fare in battle. There’s actually a whole hidden level of stats called Individual Values, or IVs which will contribute to the strength of any given creature. As such, it’s best to catch as many Pokémon as possible, even if you already have a particular creature, if for no other reason than to ensure you get the best possible version of a Blastoise, or Raichu, for instance. The thing to keep in mind is that, although CP is important, as well as the particular battle moves a Pokémon has, it doesn’t tell you the whole story, and you could ultimately end up with a weaker Pokémon than you realise, once you get into evolving. Luckily, there’s an online calculator that can help you determine whether a Pokémon is worth the effort it takes to train it up and evolve. You can find the IV calculator here. It’s also worth mentioning that moves are important. All Pokémon will have two attacks they can use during gym battles. If you capture two of the same Pokémon, and one has a higher CP, don’t be too quick to trade the creature with the lower CP in to the Prof. First, check the moves for both, and if the lower CP one has higher-rated moves, it might just be worth keeping that one instead. Of course, if there’s a huge difference in CP, it’s a different story. We’d refer you to the above calculator in any case. This is a bit of a cheeky technique if you happen to have a downed Pokémon in your arsenal and don’t want to use a revive. It turns out you can feed candies and use stardust on any creature that’s been defeated in battle. That means, if you’ve got enough candies, you can evolve it while it’s still technically ‘down’. Once it gets to its evolved state it should have a full health bar. Simple, and not all that much easier than just using a revive. But it could be worth knowing in a pinch. Here’s another quick and easy one. If you’ve got a particular gym you would hate to see fall into the hands of another team, especially Spark and his band of Yellow scoundrels, you might consider fighting at your own gym. Why would you do such a thing? Well, each Pokémon you defeat will gain XP for the gym itself. Rack up enough XP and the gym will level up – unlocking more spaces for you to add new creatures to defend it. It’s worthwhile, as the more Pokémon you have there, the easier it will be to defend. And defending a gym nets you Pokécoins, which you can use to buy all manner of helpful supply in the store. Hope the tutorial to play pokemon go for beginners was helpful to you as a beginner. Stay tuned for more pokemon go tips coming.